Daylight saving time is here again, and the weather is getting warmer. As I am sure all of you are aware, Easter comes late this year, too. Consequently, I am writing about a white wine this month that is good to drink in warm weather and pairs well not only with traditional Easter fare but also Asian and spicy foods—Anne Amie Cuvee A Amrita. The Anne Amie winery, in Oregon’s Yamhill-Carlton AVA, was founded in 1999. It is both Salmon Safe and LIVE certified. I like their wines. In fact, I wrote about the Winemaker’s Selection Pinot Noir, in the November 2017 post. This nicely balanced, lightly effervescent wine is a blend of 32.1% Riesling, 25.5% Pinot Blanc, 13.9% Müller-Thurgau, 11.4 Viognier, 7.1% Gewürztraminer, 6% Chardonnay and 4% Pinot Gris. It is dry to off-dry (9 g/L residual sugar) with balanced acidity (6.8 g/L) and a light body (3.1 pH). The alcohol content is 12.9%. On the nose, I get elderflower, lychee, and quince. These aromas carry through the palate with minerality and a hint of ginger. The medium finish is clean, with effervescence, more mineral notes, and some spice. 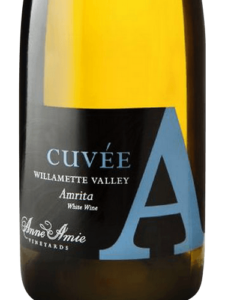 We have Anne Amie Cuvee A Amrita in stock and on sale at O’Bryan’s for $12.99 per bottle. Stop in, get some, and try this unique and very interesting wine.